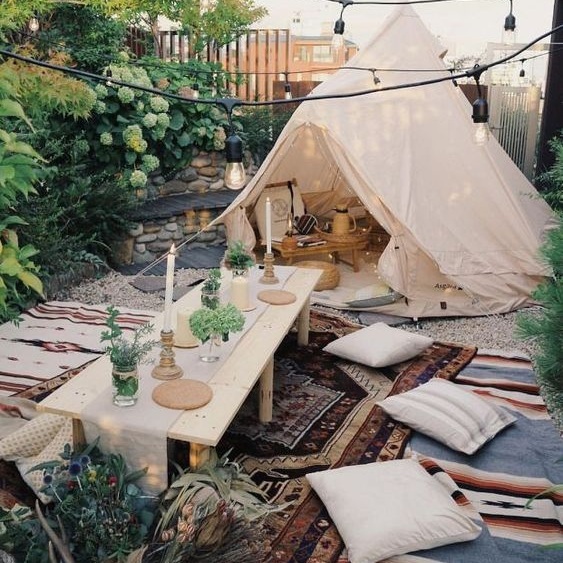 Camping festivals may not be for everyone, but a glamping situation can peak the interest of even the bougiest festival attendees. BangOn!NYC understands that some of us prefer an actual bed to a sleeping bag, and would rather shower with hot water than have a friend hold up a gallon-jug in an attempt to wash oneself. From cabins to pre-set glamping packages, Elements Lakewood has no shortage of options for those who prefer a more opulent festival experience. But if you’re wanting to experience the good-life but not down with the price-tag, have no fear: there’s a contest for that. DoNYC and BangON! have teamed up to giveaway a pair of three-day festival passes complete with the whole glamping experience. We’re talking cozy risen cot beds (can you say luxury), hot showers, changing rooms complete with mirrors (so you can look your finest while dancing at all hours of the night), and a beauty salon area, all outfitted in the boho-chic burner aesthetic that defines the BangOn! experience. Not feeing so lucky? On-site cabin options are also available, complete with electricity, showers, toilets, cots, and even a mini-fridge for your selection of festival snacks. Glamping packages can also be added on to any three-day ticket if you want to lock down your sleeping arrangements without trying your luck.